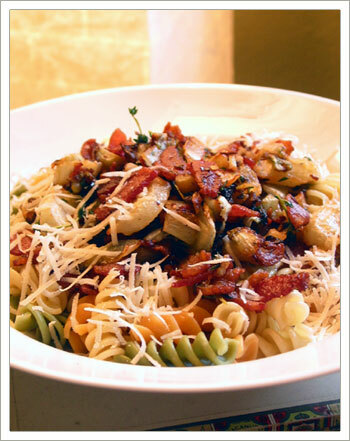 So, I still had bacon left over after my last pasta + bacon meal, and it didn't take long to sidle back up to it. Why waste a good thing? I like keeping bacon around because it's easy to cook, long-lasting, and a cheap, quick source of protein. Oh, and it's darn tasty too. This recipe made use of one more fridge-hangabout that I had to use up, too; I had bought a pair of Belgian endive from the produce stand, seduced by their pale, pointed shapes, like the palm of a hand, or the trowel you use to turn over the earth in your garden. I tossed one, sharp, white and crunchy, in a salad with some cucumber, but I found its bitterness disconcerting, too much at once to eat raw. So its companion was left to wait about until I decided to take a chance on cooking it. I don't have any experience with cooking things that normally go in salads, except for spinach, and I was apprehensive. But this is wonderfully delicious, the bitterness tempered and softened by a slow cooking session in sweet bacon fat and savory thyme. I felt the small thrill of victory that comes when I use something old in a new way - I might even buy endive again. 1. Cook the rotini according to package directions. Reserve half a cup of the pasta water, then drain the pasta. Stir in the reserved water and some olive oil, then set aside. 2. Slice the bacon into 1-inch bites, and sauté over medium heat until cooked through, but not crispy. 3. Add the garlic, onions, thyme, and endive, chopped into bite-size pieces, and sauté over medium heat, slowly, until softened and slightly transparent. 4. Add salt and pepper to taste, then put on top of pasta and add Parmesan cheese to taste. next time, i'll have to throw in some bacon too! 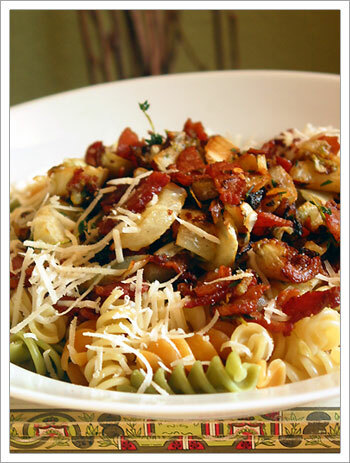 The art of leftovers is one of the most important skill.Thank you so much for sharing wonderful recipe of Rotini with Bacon and Thyme here.I love cooking and I going to try this best recipe for my lunch.